A beachside pub is like a clubhouse where everyone’s a member and your reward for avoiding bluebottles and sunburn is cold beer and fish and chips. Ideally it’s a volleyball’s bounce from the shoreline, stocks the kind of summery beers you’d expect to see in Contiki commercials and isn’t too fazed by a little sand caught in your pockets. 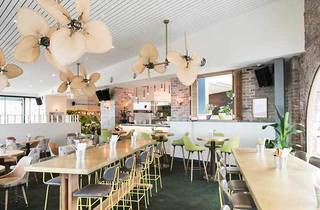 In very good news for the Northern Beaches, the Collaroy Hotel ticks all those boxes. It still looks out over the south end of the beach, but what used to be the old Surf Rock Hotel has become a seaside saloon going full tilt with the coastal theme. The chairs are upholstered in a trout print fabric, there are raffia-style fans turning lazily overhead and where possible they’ve put in glass ceiling panes to let the seaside sunshine stream on in. Get in early for box seats out on the terrace looking down onto the beach. The beer fridges split the shelf space between summer holiday brews like Corona, Miller and Aquila and a tentative craft beer range with Rocks, 4 Pines and Endeavour, but it’s down to Reschs, VB, Dirty Granny cider, Peroni, Carlton and Fat Yak on tap to do the heavy lifting in the name of hot weather refreshment. There’s steak, burgers and schnitzel on the menu here, but they’re a lot more interested in the fruits of the sea than the herds of the land. Coffin Bay oysters come natural or with seaweed salad and a soy and mirin dressing. Tempura rock prawns and fish tacos join forces with salt and pepper squid for shared seafood snacks. The fish and chips are simple and tasty. Although they opt for skinny steak fries instead of hand-cut chips, our tender flathead fillets wear a gratifyingly crunchy armour and the tartare is good and tangy. Need a sugar rush? They pack a meringue shell with lemon curd, scatter some berries and mandarin wedges over the top and cap it with a scoop of vanilla cream. 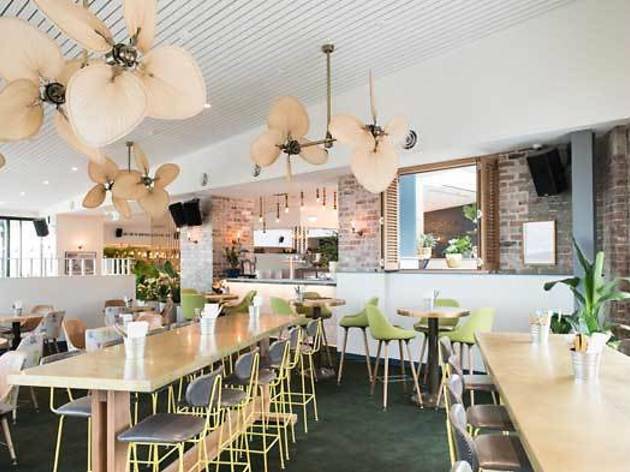 Short of a floating bar amongst the white water, the Collaroy Hotel is the place to recover after three rounds with the breakers and some seafood and schooners by the sea.